The nightstand is the cornerstone of the bedtime experience, and infinitely useful as well. If you are a reader, or you want somewhere for your glass of water and vitamins, the nightstand is the perfect place to put them. But, these days, our tastes are evolving, and there are a lot of different replacements you might consider instead of a nightstand. It really depends on how creative you are, and the sorts of things that interest you. Both fashionable and functional, nightstands have played a huge role in the bedroom for some time. It’s important to make the right choice when picking a nightstand because you want to get something that is large enough to suit your needs but will fit by the bed comfortably. It’s also a great way of showcasing your personality and what you enjoy as a person. Here are some of the best choices for nightstands, that might be a little more unusual. We’ve all seen that arty design where there are suitcases balanced on top of one another and used as a chest of drawers, or a table. You might think that vintage suitcases stacked by the bed will look like someone just forgot to tidy them away, but that’s not the case! They can actually be a remarkably effective bedroom feature. The great thing about these is that their size and shape make them suitable for any space or surroundings. There are so many excellent things you can do with cases that they are an invaluable addition to the nightstand back catalog. Yes, believe it or not, that chair you’ve had by the desk this whole time can actually be used as a nightstand. Sure, you could buy a separate one, but, you could also double up with one chair between desk and bed! Anyway, a chair looks cool and trendy, especially if it’s the right type of chair, and there are so many wicked designs. The possibilities are basically endless, and you can get chairs of every possible color and design. This is a unique and cool way of making sure you have the best possible nightstand. This could be an antique dresser, a stacked set of drawers, or even a chest! 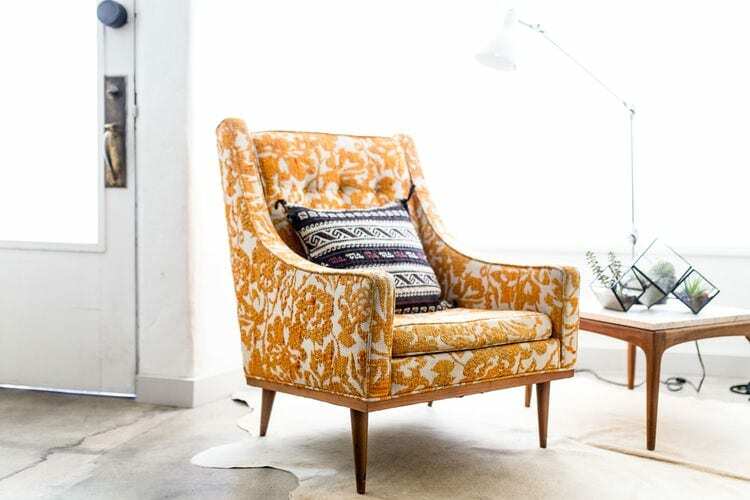 Using antiques brings a cool retro vibe to your home, and really helps you to come up with an excellent way of making your room look extra special. There are so many different types of antiques to choose from, and you’ll be best off picking something that fits the aesthetic of the room. Antiques can be an invaluable substitute for a regular nightstand in your bedroom. A slightly different approach would be to take away the nightstand and put it above you. By that, we mean put together some shelves on the walls above the bed, and you can use them in a similar way to the way you would use a nightstand. And, there will be plenty of room for more books, so you’re never going to be short of something to read when you use shelves. These are some amazing alternatives for your nightstand, and they will all help to improve bedtime, not to mention making the room look better. What you choose is entirely down to your personal tastes and needs. But, it’s important to know that there are plenty of choices out there, and you don’t just have to go for a generic nightstand.